As the famous Mythbuster Adam Savage once said, “Remember kids, the only difference between [messing] around and science is writing it down”. The same can be said for archaeology and conservation. Photography is a tool which conservators use to record data throughout an artifact’s entire treatment process, and an archaeological illustration can capture minute and important details following treatment. Immediately upon excavation, an artifact is first photographed in its as-recovered state with a centimeter/inch scale. This is referred to as the field image. The field image lets the conservators know what the concretion looked like as found on the sea floor and serves as a primary record in case anything happens to before it reaches the lab. Following x-radiography and studio photography, the conservator can then begin breaking down the concretion. Photography continues throughout the breakdown process, at the end of each cleaning session as well as each time a new artifact is extracted from concretion. These are known as working photos. There are many ways to photograph an artifact post-treatment, but at the QAR Lab we photograph artifacts on a black background (aside from glass fragments, which require a color scale and a white background) with proper lighting and scale to adequately portray the diagnostic features of said artifact from multiple views. In the end, every artifact must have at least five photos: The recovery/field image, removal from concretion image, pre-treatment, post-treatment, and a final photo prior to transfer to the NC Maritime Museum in Beaufort. You don’t need to be an artist to be an archaeological illustrator, but sometimes a little background in art certainly helps. Traditional artifact illustration has been a part of archaeology and conservation since the beginning and is often used to highlight the details of an artifact which are harder to capture via photography. 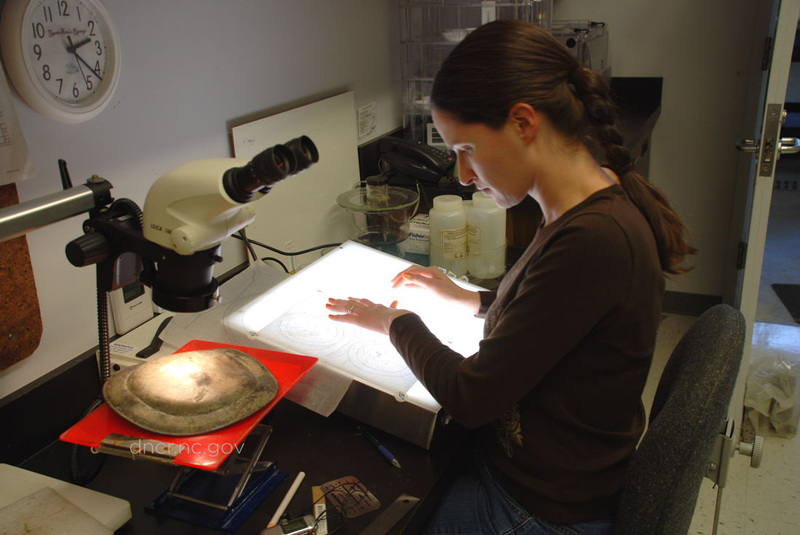 Conventional processes require the use of proportional dividers and calipers, but through the use of computer software it is easier to establish the scale of the artifact you wish to illustrate, then print out the artifact image and use a light box to create a pencil drawing. Composition is up to the illustrator as well, but it usually involves multiple views and multiple scales. The process following the pencil drawing is much the same as it has always been, with the illustrator inking over said drawing on a material called mylar. In many cases, the best illustrations come from using methods both old and new, as every artifact poses unique challenges. -Caple, Chris. Conservation Skills: Judgment, Method and Decision Making. London: Routledge, 2000. -Griffiths, Nick, Anne Jenner, and Christine Wilson. Drawing Archaeological Finds: A Handbook. London: Archetype Publications Ltd, 1990. 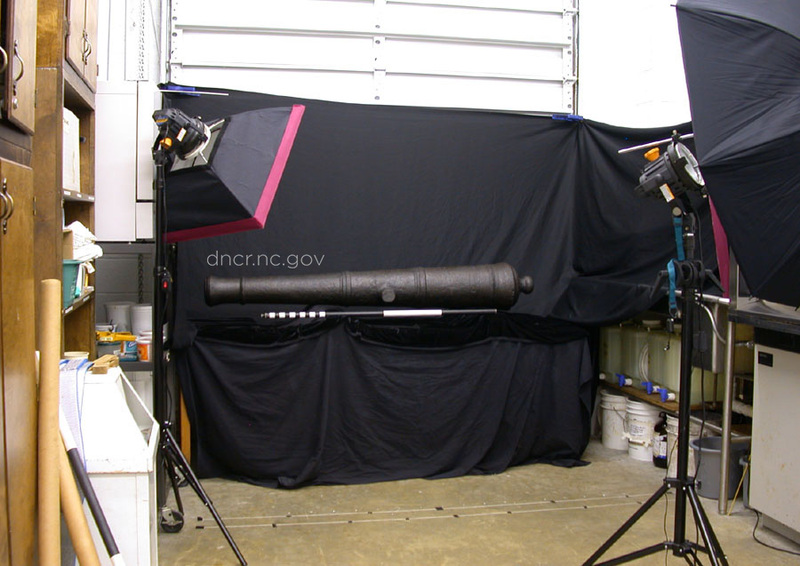 -A cannon from the QAR site set up for final photography. Image by NC Department of Natural and Cultural Resources. -Illustrating a pewter plate from the QAR site. Image by NC Department of Natural and Cultural Resources. 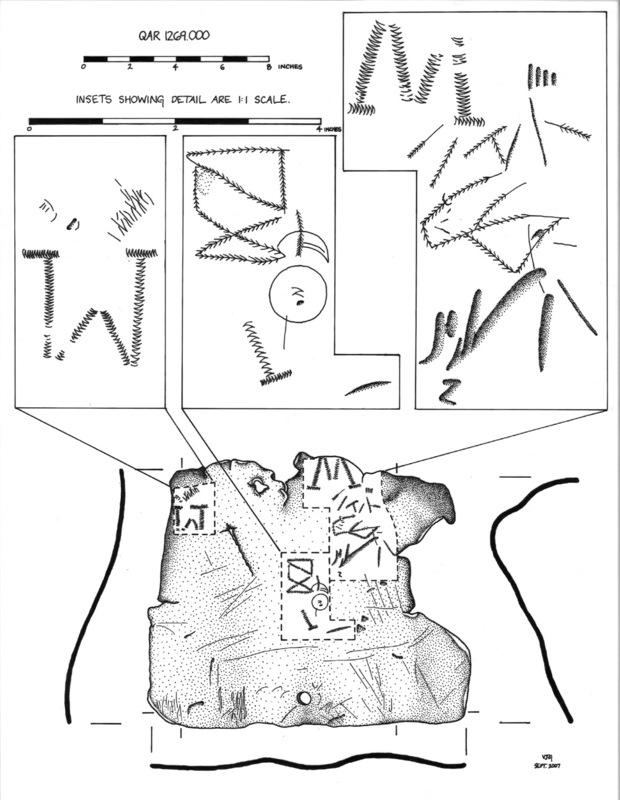 -Illustration of a lead apron with graffiti from the QAR site. Image by NC Department of Natural and Cultural Resources.